Commuters in the capital will soon get exact schedule, location and seat availability regarding DTC buses and details required to hire autorickshaws through a mobile app. The app is part of many other initiatives being taken by the city government to streamline the public transport sector which include integrating bus, metro and autorickshaw services. Around 40 lakh commuters travel by around 6,000 buses operated by Delhi Transport Corporation and Deputy Chief Minister Manish Sisodia said government is planning a series of steps to improve the bus service. “For making the city congestion and pollution-free, we need a better public transport system. Keeping this in mind, we have developed a mobile application through which commuters can get details of location, seat availability and schedule of DTC and Cluster buses plying in Delhi,” the Deputy Chief Minister told PTI. He said government has decided to buy 10,000 buses and some of them will be procured through public-private- partnership. To ensure commuting hassle-free, he said government is also planning to introduce a common card which can be used in Metro, buses, autorickshaws. He, however, did not elaborate much about it. Explaining about the app, he said commuters waiting at bus shelters can check frequency, route details, arrival time of buses on their phone through the app. Sisodia said the government is testing the app and will launch it soon. It will enable users to fetch location and mobile numbers of nearest autorickshaws drivers. 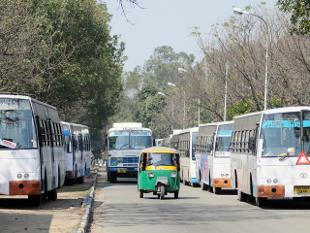 At present, 4,700 DTC buses and 1,300 buses under cluster services are operating in the city. The total number of autos is more than 84,000. “Commuters using autos will also be able to use the government’s application on the line of private taxi aggregators and can fetch location and mobile details of drivers,” he said.